HONG KONG, April 2, 2013 – – The South China Morning Post has launched its inaugural issue of 100 Top Tables 2013, a definitive chief executives’ guide to the best restaurants in Hong Kong and Macau for entertaining clients. The 100 selected restaurants were also presented with a special certificate of recognition for their exceptional cuisine and venue. “The guide provides a comprehensive list of select places where top executives can entertain not only important clients, but also have a relaxing evening with friends. These selections were made not only with just the food in mind but also creativity and the total dining experience,” said Winnie Chung, Chief Editor, Specialist Publications. 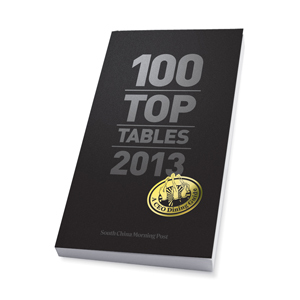 The 100 Top Tables 2013 will be distributed direct to SCMP subscribers as well as through retail outlets, Asian airport lounges, airport stores and Pacific Coffee outlets.